Heather Hoch The mole poblano at Los Portales is homey and sweet. Open Tuesday-Thursday: 9 a.m.-9 p.m., Friday-Saturday: 7 a.m.-10 p.m., Sunday: 7 a.m.-9 p.m.
Los Portales sits near the border of South Tucson, just south of 36th Street on South Sixth Avenue. From the outside, it looks like it could be a place where you buy rustic metal furnishings and décor, with large purposely-rusted art installations peppering the building's edifice. You might continue thinking it's a home décor store until you read the word "cocina." Inside, the eight-year-old restaurant features murals from artist Luis Mena and more accents imported from Guadalajara. It's a busy look, compared to the modern, stripped-down restaurant aesthetic that many spots in the Los Portales price range exhibit, but it's not without its charm. Similarly, the menu, which is six pages in total, has a mix of photos and fonts that would probably make the restaurant's ilk turn their nose up a bit. All of that aside, I'd place the restaurant's food somewhere between Café Poca Cosa or Penca and smaller mom and pop digs—it's not quite upscale dining, but it also has a certain home-spun feel that is undeniable. Dishes at Los Portales can hit up to the mid-20s in price, especially if steak is involved. It's definitely pricey, and, with only one other table ever being there concurrently with my visits, I'd worry those prices are scaring away customers, though they're not entirely unreasonable given the large portion sizes. Regardless, once you're there, you'll be greeted first with the ubiquitous offering of chips and salsa. The chips are warm and the salsa is addictingly spicy, making it difficult not to fill up on it before your order ever arrives. You can also opt to begin your meal with your choice of cheesy starters like queso fundido, quesadillas and tostada de queso ($7.99-$12.99, depending if you add meat). Los Portales also offers four salads and 12 soups, the last of which are offered in a small starter size or a large entrée size. Of the soups, the albondigas is served in a fatty, clear broth with moist, tender meatballs packed with herbs. While it's not technically an appetizer, the sopes ($9.59) also make a great starter, especially if you're dining with one friend. The set of two puck-like (in shape, not texture, mind you) circles of masa are crispy and fried on the outside, but soft on the inside, providing a great base for either beef or chicken on top, though the chicken itself was on the bland side. The restaurant also offers several combo plates ($8.95-$12.45) for the indecisive, offering a mix of enchiladas, chile rellenos, tamales, tacos, machaca, flautas, calabacitas and more served with rice and beans. While any of the steak dishes will price out at the highest, Los Portales offers a full page of shrimp and fish dishes for just under $14 per. If you're waffling between seafood or steak, seafood seems to be the better deal here. However, the tampiqueña ($18.99), which pairs a medium rare steak with perfectly caramelized onions and a cheese enchilada, won't disappoint if you order it. In terms of house specials, grilled skewers, fajitas and more are offered. The carnitas ($11.99) are just as crispy as you'd ever want them to be, though the frying did dry out the pork significantly. However, one you pile the carnitas on your choice of flour or corn tortillas (from Alejandro's Tortilla Factory) and top with some of the aforementioned hot salsa, you'll likely forget the dryness of the carnitas altogether. 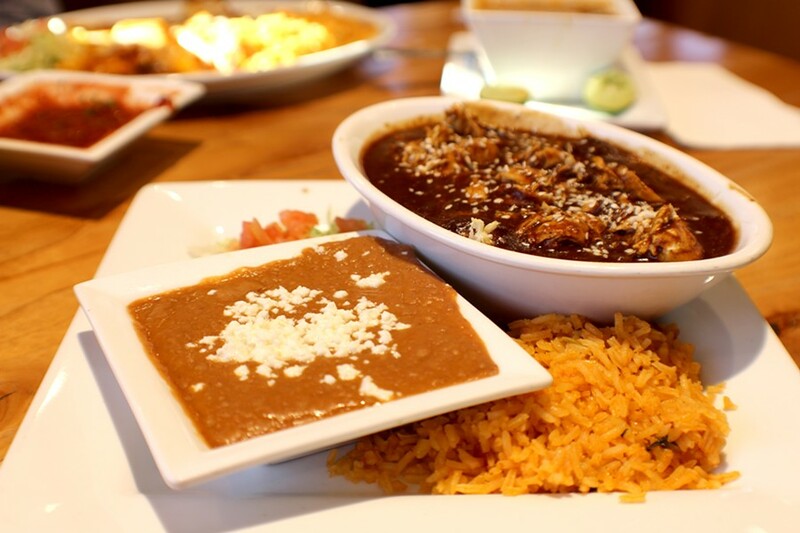 One of the unexpected favorites from Los Portales, though, is the mole poblano ($12.99). While I love mole poblano most times I order it, Los Portales offers something a little different with theirs, and I'm pretty sure their secret ingredient is either peanut butter or peanut sauce. Don't dismiss the dish for that, though. It's the sort of homestyle addition that makes this place feel like eating at grandma's house. The mole itself is also quite a bit sweeter than you may be used to, but I still found myself sopping it up with tortillas to get every last bit. As for where it fits in, it just might not. Los Portales isn't trying to be trendy or fancy. It offers a homey spot to sit down and eat generous portions of Mexican classics. It's not quite in Tucson. It's not too expensive, aside from a few of the notably pricier options. It's kind of stuck between the choices for Mexican dining to which we've grown accustomed, but that's certainly not a bad thing.